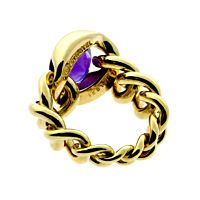 A vivid Purple Amethyst entices admiring glances while fine 18k Yellow Gold serves as a sumptuous frame on this exceptional Chain Link Ring by Chanel. 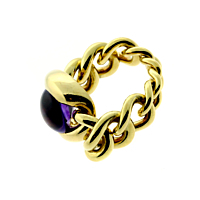 The contrast between the Amethyst and the Yellow Gold is pronounced enough to emphasize the best qualities of each, yet not so sharp as to deny the piece its overall cohesion. Flawlessly balanced, strikingly classy, and undeniably eye-catching - what more could a discerning lady want?